Seward Park is a neighborhood and park on the Bailey Peninsula in Lake Washington. West of Rainier Avenue is the community's small business district, but the eastern shore of Andrews Bay and the lake is mostly residential. Houses for sale in Seward Park are a diverse mix of small cottage-style homes and stately, lakefront mansions. The park itself is over 300 acres in size and contains some of Seattle's last remaining old-growth forest; it is a great place to watch bald eagles or go for a jog while enjoying an incredible view. 3 Beds | 3.5 Baths | 2450 sq. Ft.
2 Beds | 2 Baths | 1073 sq. Ft.
4 Beds | 3.25 Baths | 2418 sq. Ft.
4 Beds | 2.5 Baths | 3100 sq. Ft.
4 Beds | 1.5 Baths | 2600 sq. Ft.
4 Beds | 3.25 Baths | 3800 sq. Ft.
5 Beds | 2.25 Baths | 4140 sq. Ft.
5 Beds | 4 Baths | 3980 sq. Ft.
2 Beds | 3 Baths | 3890 sq. Ft.
4 Beds | 2.5 Baths | 3850 sq. Ft.
4 Beds | 3.5 Baths | 4883 sq. Ft.
5 Beds | 3.5 Baths | 3800 sq. Ft.
4 Beds | 3.5 Baths | 2530 sq. Ft.
4 Beds | 2.5 Baths | 2989 sq. Ft.
6 Beds | 6 Baths | 7498 sq. 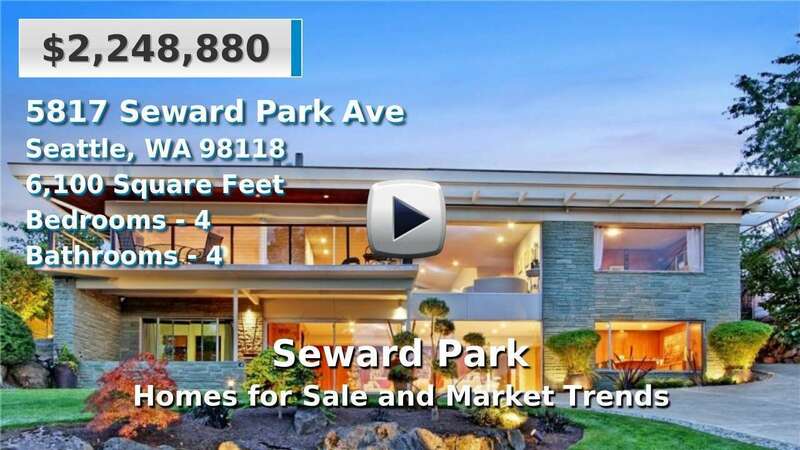 Ft.
Blue Summit Realty has the most accurate and up to date Seward Park real estate listings on the web. Currently there are 17 homes for sale, 1 condos for sale, and 3 vacant land properties in Seward Park. Of the 21 total Seward Park residential listings for sale 0 are bank owned, 0 are short sales, 0 are new construction, and 0 are townhomes. The price ranges from $379,950 to $0 with a median list price of $1,577,317 and median sold price of $810,740. Make sure to refine your Seward Park real estate search by property type, price, square footage, bedrooms, bathrooms and more with the search tool above or view the Seward Park listings on our interactive map. Our Seward Park real estate listings were updated 7 minutes ago.